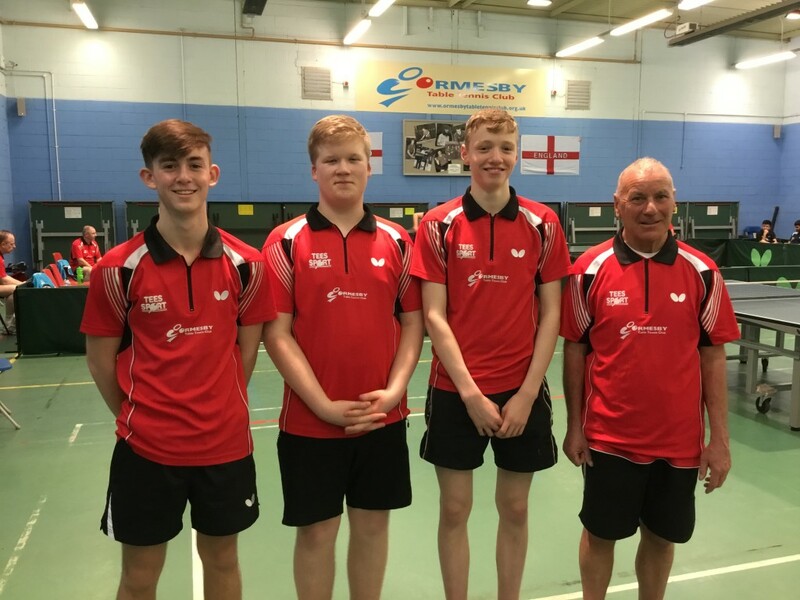 Ormesby players, Joe Cope (Senior Boys), Thomas Rayner (Intermediate Boys) and Ben Piggott (Cadet Boys) all played for England at the Butterfly Schools’ International Championships in Worcester over the weekend of 22 to 24 June 2018. Well done to all three players who all returned with medals. Marc Bonnar on the left and Noel Thomas won Bronze medals in the team event. All the practice has paid off lads !!!! 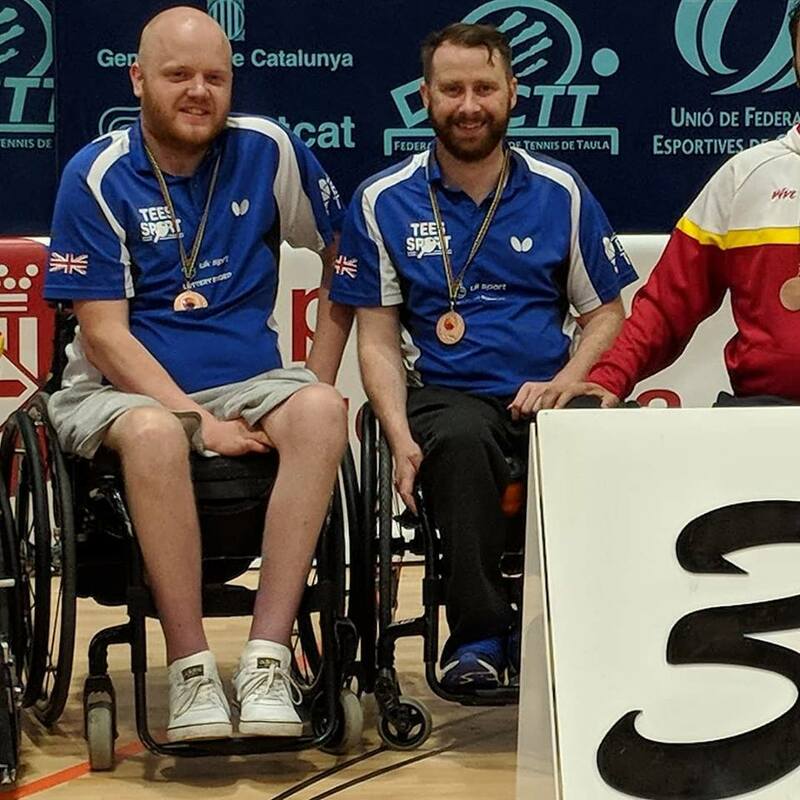 Marc Bonnar and Noel Thomas are assured of a medal in the men’s 1-2 team event at the PTT Spanish Open in Sant Cugat del Vallḗs, near Barcelona while Craig Allen took bronze in the men’s class 9 singles after losing his semi-final to the World number three and European bronze medallist Juan Perez Gonzalez 3-0. Bonnar and Thomas faced top seeds Spain in their first match and after losing the doubles 3-0 Thomas was beaten 3-0 by by Iker Sastre, the class 2 world number 11 who had earlier won gold in the men’s class 1-2 singles. 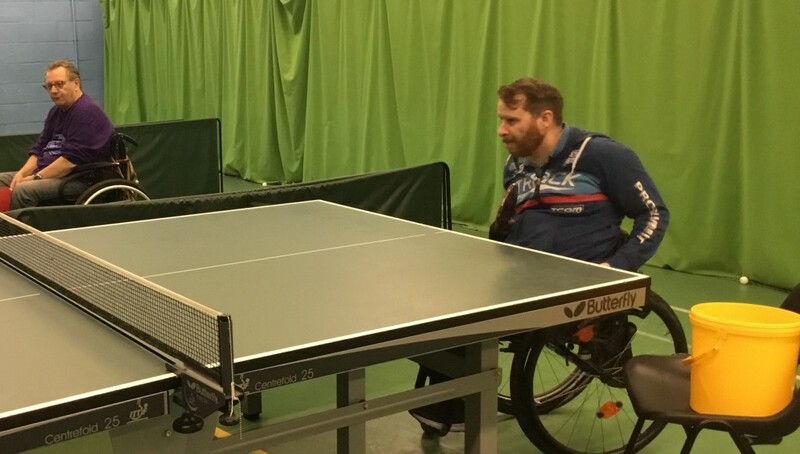 The British pair progressed to the semi-finals with a 2-0 win against Finland, combining well to take the doubles 3-1 before Bonnar won the first singles tie against Timo Natunen. On the first day of the 2018 PTT Spanish Open in Sant Cugat del Vallḗs, near Barcelona two of the Ormesby Wheelers were competing in the event. On his international debut 38 year old Noel Thomas lost his first match in the men’s class 1-2 singles to Fernando Eberhardt, the class 1 World number 10 and PanAmerican champion from Argentina, 3-1 but progressed from his group with 3-1 wins against the unranked Spaniard Lazaro Rodriguez and the veteran former class 1 World, Paralympic and European champion Matti Launonen from Finland. Thomas, from Redcar, was beaten 3-0 in the quarter-finals by the former European team bronze medallist Miguel Angel Toledo from Spain. Also in men’s class 1-2 Marc Bonnar from Ingleby Barwick lost both his group matches to Iker Sastre the class 2 World number 11 from Spain (3-0) and 19 year old Thirayu Chueawong from Thailand (3-1). Three Ormesby Junior players have been chosen to represent England at the Butterfly School Invitation International championships to be held at Worcester Arena from June 22 to 24. Joe Cope will play in the Senior Under 18 Boys. 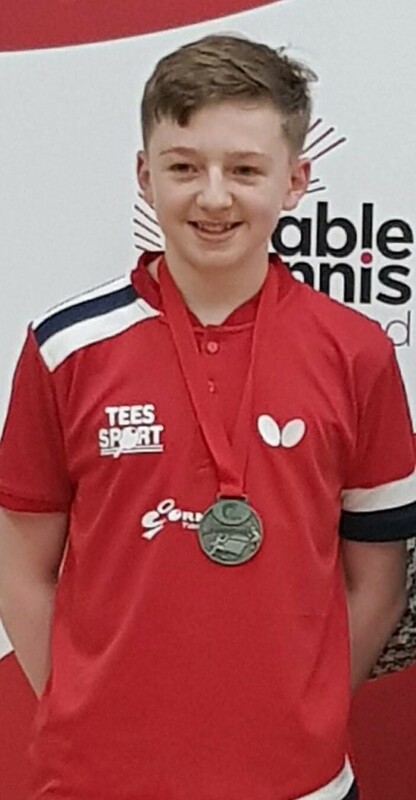 Thomas Rayner will be playing in the Intermediate Under 16 Boys. 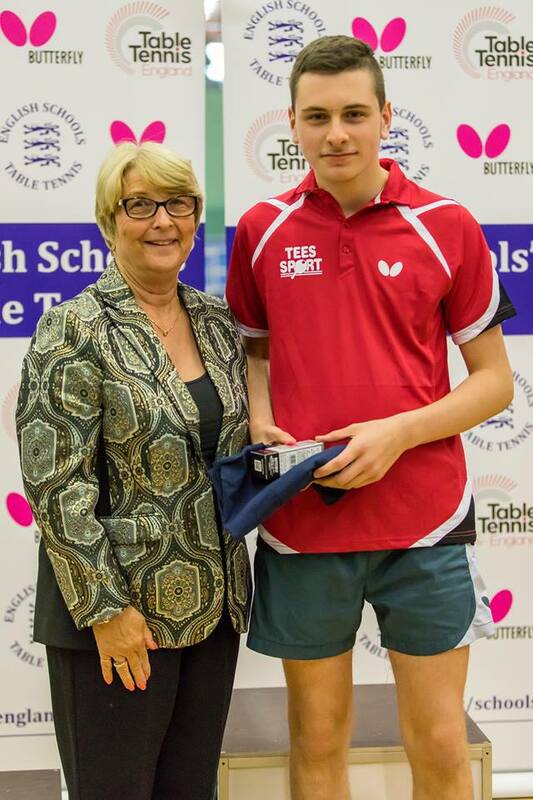 Ben Piggott will play in the Cadet Under 14 Boys. has been chosen to represent England in the European Youth Championships in the Cadet Boys team event. The Championships are to be held in Romania from July 15 to 24. 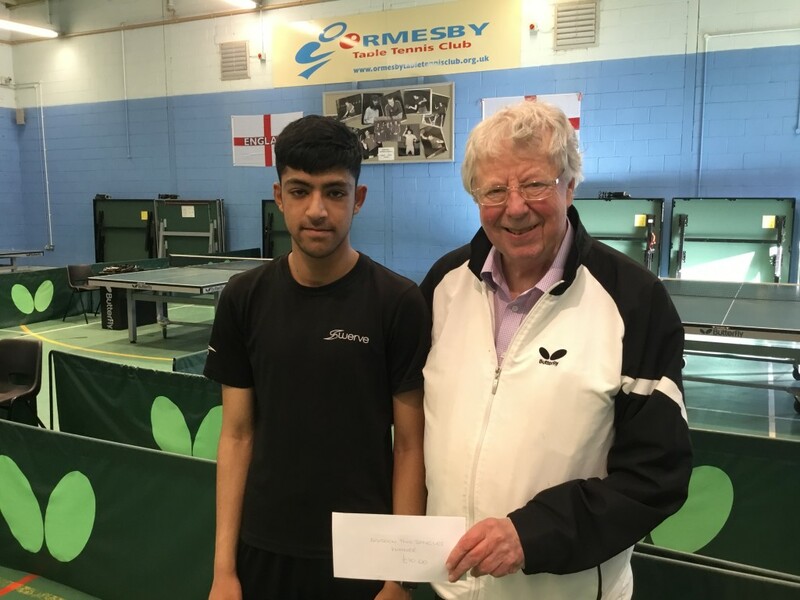 The Ormesby Premier team finished in 2nd position in the Premier Division of the British League for the third season in a row after their main rivals Urban of London won both their fixtures over the weekend beating Drumchapel of Glasgow 8-0 and Ormeau of Northern Ireland by 7-1. Ormesby finished with a much better set average than Urban 65 wins to 15 losses against Urban with 58 against 22 but Urban had one more point having defeated Ormesby by 5-3 in the opening fixture of the season. 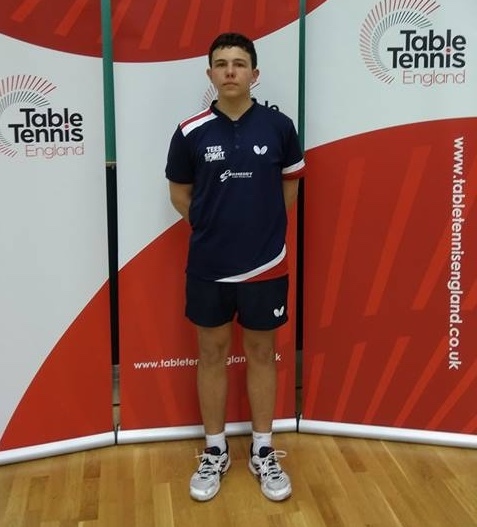 Ormesby player Joe Cope had a really good two days at the 2018 Junior National Cup finishing three places above his seeded position. Joe began the weekend seeded 6th and after the first days play he was tied in 5th third place. On the second day of competition Joe won 4 games out of 4 to take the bronze medal. 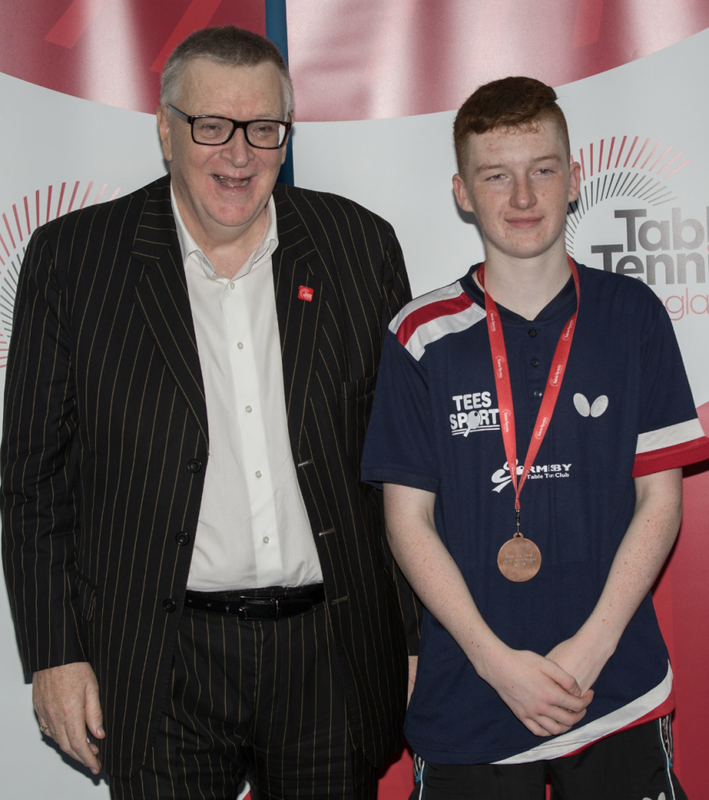 In the picture above, Joe who lives in Hartlepool, was presented with his bronze medal by fellow ‘Hartlepudlian’ and Table Tennis England Treasurer Keith Thomas. Ormesby continued their unbeaten run of nine matches in the Premier Division of the British League Premier Division beating the current champions Drumchapel by 8-0 at the club’s headquarters on Sunday. All four Ormesby players won both of their singles in a convincing manner. Joe Cope came into the match in the place of Viktor Brodd won both of his sets in the fourth position against Zaid Khalid and Thomas Cairns both in straight games. Darius Knight and Danny Read also won their matches by a comfortable match. Only one set reached the fourth game when Yaser Razouk won the first game against Danny Read. Ormesby now lead the table with 17 points from 10 matches. Favourites for the Championship Urban from London have 14 points from 8 matches. They have their two fixtures against Drumchapel and the Northern Ireland team Ormeau to play this weekend. They need to win both if they are to clinch the title as Ormesby’s set average is significantly superior. 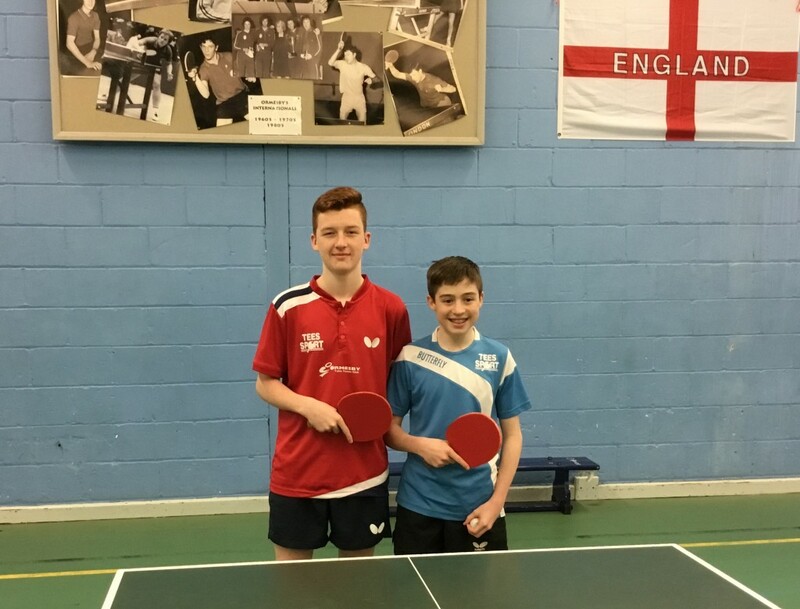 Ormesby junior, Chris Edwards, won 3 titles, including the Open Singles title, in the Middlesbrough Table Tennis Championships which were played at Ormesby last weekend, beating Ryan Nassau by 3 games to 1 in the final and Michael Young by 11-9 in the 5th games in the semi final. This was a very good performance by Chris who plays in the team immediately below his two opponents in the Ormesby British League teams. Ryan Nassau had a very close match in the semi final to beat David Pashley 11-5 in the decider. 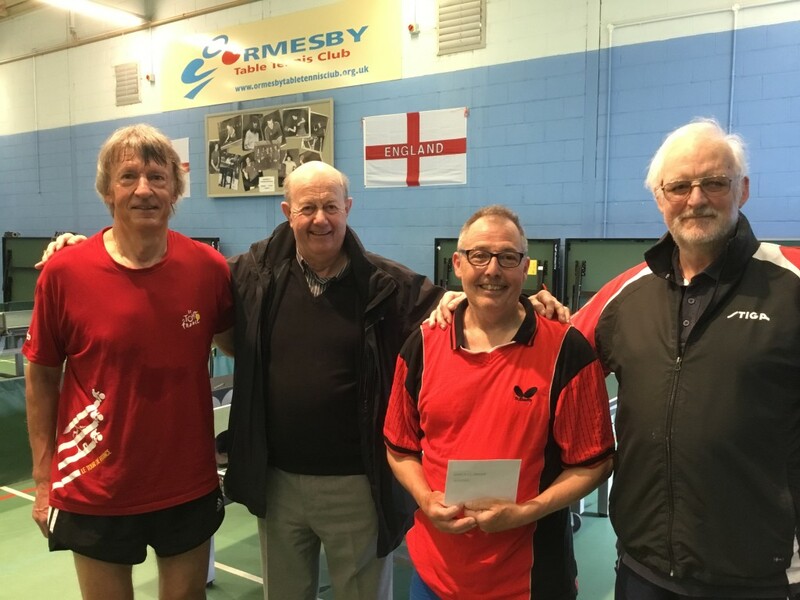 Chris Edwards won his second title in the Open Doubles when he combined with Ryan Nassau to beat Michael Young and Gary Whyman by 3-1 in the final and the Webster brothers, Phil and Tommy, by the same score in the semi. Edwards’ third title came in the Handicap Singles when he scored a very narrow victory over Olly Flight who enjoyed a large handicap start. Olly won the first game 21-17 before Edwards recovered to win the second 21-19 and the decider at 21-20. The Division 1 Singles title was won by Michael Young who scored a very narrow victory 11-9 in the 5th, over Ryan Nassau. Michael Young beat David Pashley 3-0 in the semi. 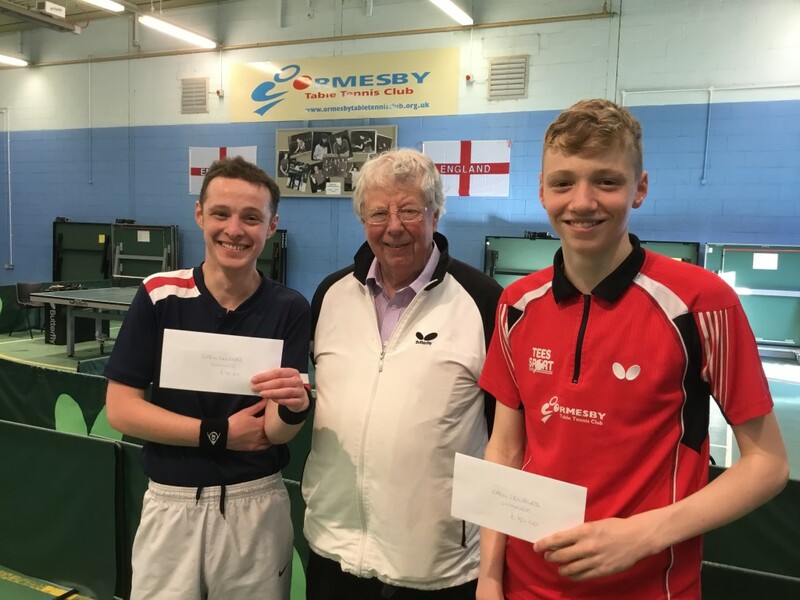 The Open Singles winner, Edwards, failed to qualify from his group, losing a countback with Michael Young and Ryan Nassau. The Division 2 title was won by Swerve’s Kashif Mahmood who beat Beaumont Accountancy Nomad’s Bruce Lowther 3-0 in the final. Michael Young won his second title, the Veterans Singles, scoring a comfortable victory over Swerve’s Jemal Mohammed in straight games in the final. Nick Miller (semi finalist), Barry Pearson (event sponsor), Tommy Webster (60+ winner) and Paul Moppett (Runner up). Eric Smallwood, not pictured, was the other semi finalist. The Over 60 Handicap was won by Tommy Webster who beat Paul Moppett after the match was tied after 3 games. 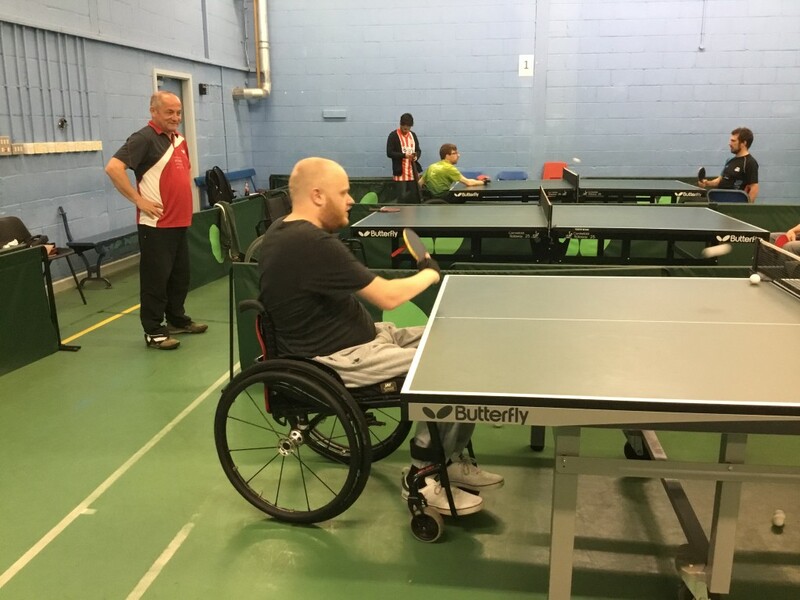 Webster won the one point decider.The Wheelchair Singles was won by Mark Bonnar who beat Brian Holloway in the final match. The Hard Bat competition produced a third title for Michael Young with Nunthorpe’s David Pashley into second place. 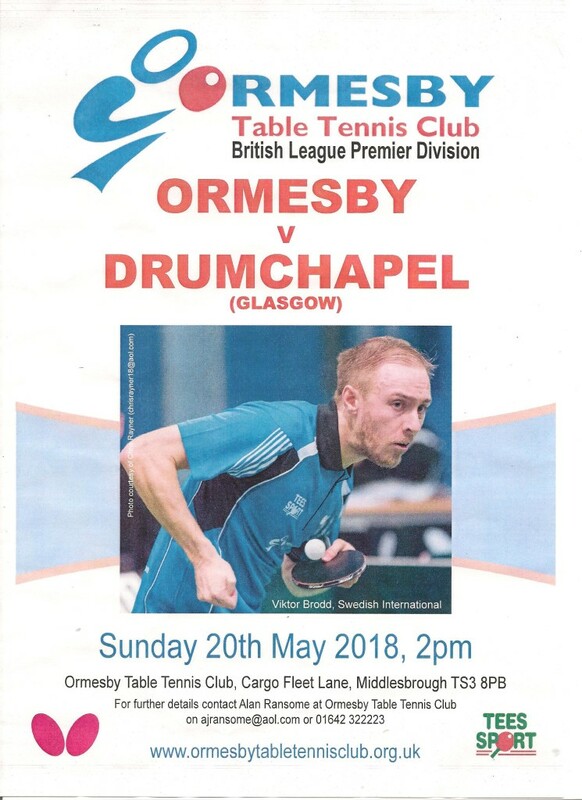 Still in contention for the Premier Division title of the British League Ormesby play their final match of the season next Sunday 20th May at home against the current champions Drumchapel of Glasgow. Ormesby currently lead the table with 15 points from 9 matches played. The Urban club from London have 14 points but have a match in hand. Urban still have to play both Drumchapel in Glasgow and the Northern Irish team Ormeau. 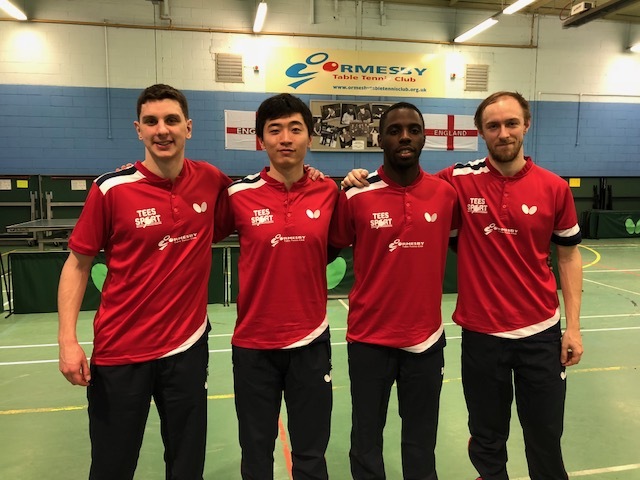 Ormesby will have a full-strength team out to play against Drumchapel which includes Danny Reed English International as Captain plus Tianmang Zhao Portuguese International, Viktor Brodd Swedish International and Darius Knight English International. The Drumchapel team has not yet been announced but could include David McBeath the current England number 4 in addition to Scottish International Craig Howieson. The match is to be played at the Ormesby Table Tennis Club commencing at 2.00 pm. 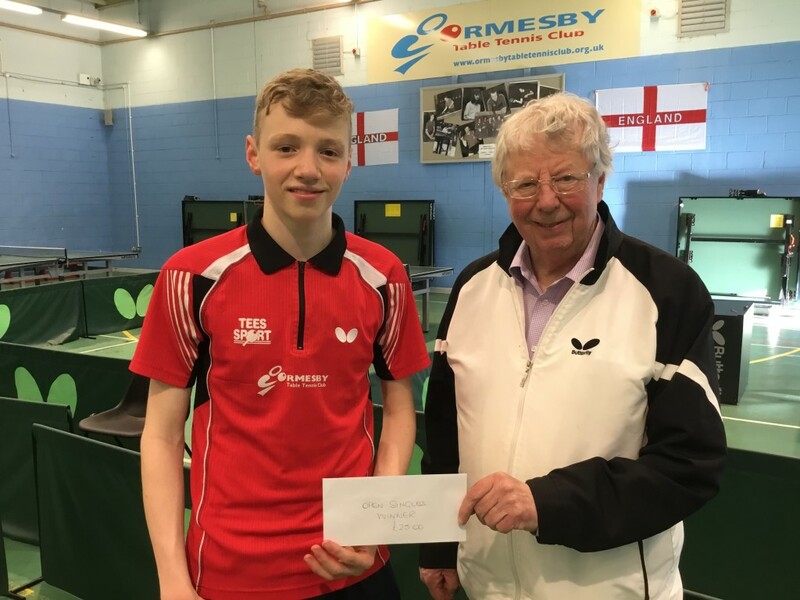 Ormesby Table Tennis Club cadet David Gofton won the Band 3 event at the 2018 Nottingham Grand Prix. Two Ormesby teams will take part in the 2018 KO Cup final. In the semi final games Ormesby B won 5 – 3 against Beaumont Accountancy Nomads and Ormesby L beat Ormesby G by 5 – 2. Jane Lynas (Nomads), Gary Whyman (Ormesby), Bruce Lowther (Nomads), Michael Young and Karl Shaw (both Ormesby) and Kevin Linsley (Nomads). Jak Ali and Edward Adams (both Ormesby L), Peter Wagner (Ormesby G), Daniel Bennett (Ormesby L), Mike Newton, Bob Wasson and team captain Syd Davis (all Ormesby G). 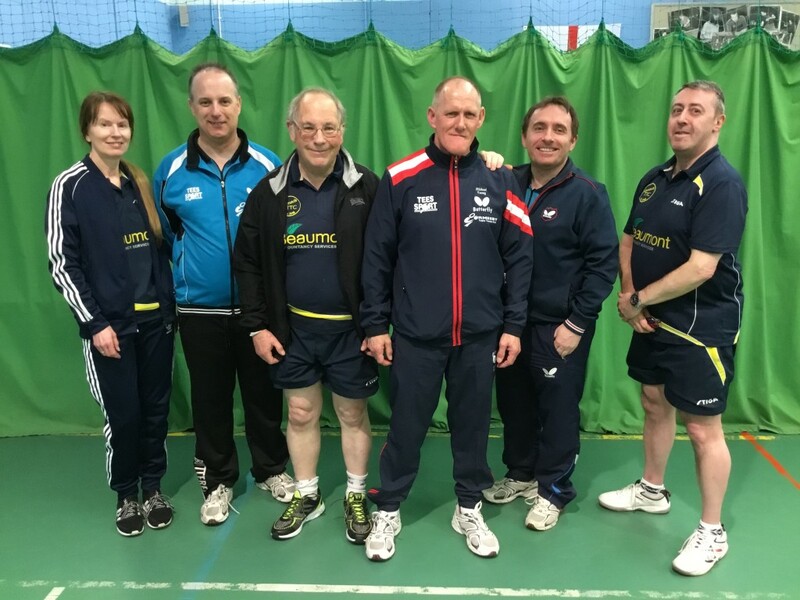 Ormesby’s first team kept in contention for the Premier Division title of the British Table Tennis League last weekend when they played a 4-4 draw with the current leaders Urban TTC of Barnet in London. For Ormesby Viktor Brodd was the star man beating the Urban number one Satoshi Aida 12-10 in the decider in the opening set and then defeating Szilard Gyorgy in straight games to win his two matches. Tianming Zhao did well to beat Daniel Kosiba by 12-10 in the decider in his opening set but lost a vital match against Aida in straight games to give Urban the chance of clinching the draw. In the final match Danny Reed produced an excellent performance to come from 2-0 down against Daniel Schaffer to win 11-3 in the decider. Ormesby are currently top of the table with 15 points from the 9 matches, Urban are in second with 14 points from 8. Ormesby have just one more match to play against he current champions Drumchapel at home on the 20th May. 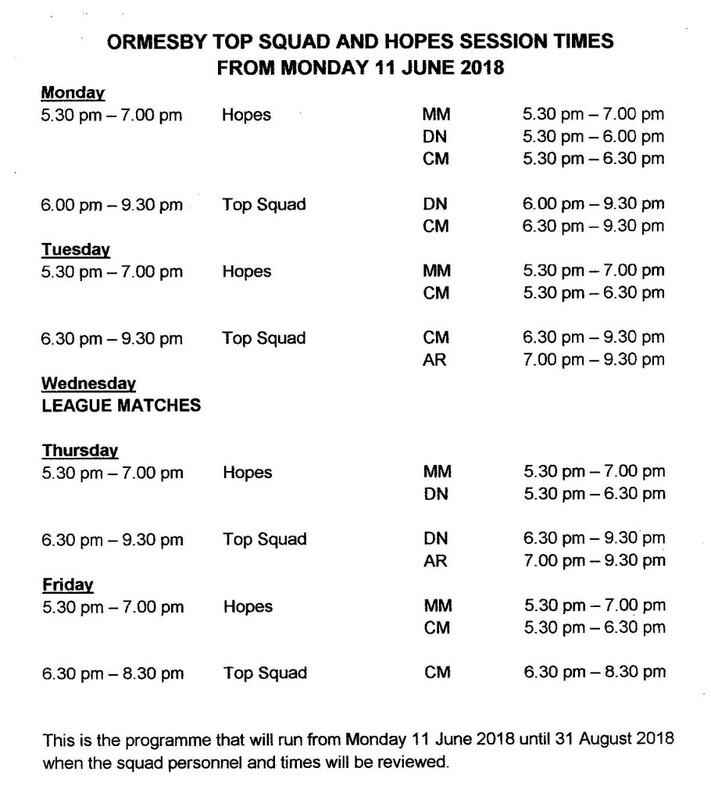 Urban have 2 matches to play against the Irish Team Ormeau and against Drumchapel of which are both at the end of May which ensures that the championship race will to go the wire. 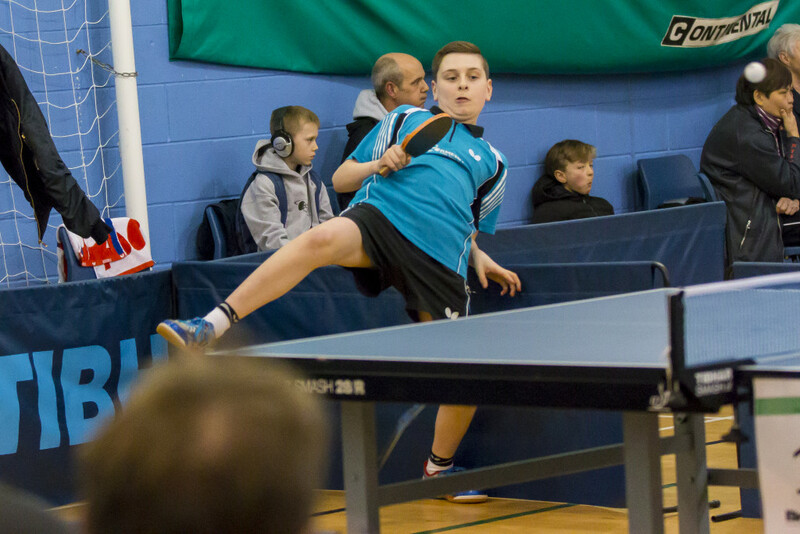 Ormesby first team are locked in a battle for the British League Premier Division Table Tennis Championship this weekend. The main match being played on Sunday when Ormesby visit the current league leaders the London club Urban who are leading the table by just one point. Ormesby need a victory this fixture if they are to take the championship. Ormesby have their best team available with Tianming Zhao who is a Portuguese International of Chinese origin. Ormesby’s second player will be the swede Viktor Brodd who will be supported in the team by two English Internationals Darius Knight and Danny Reed. 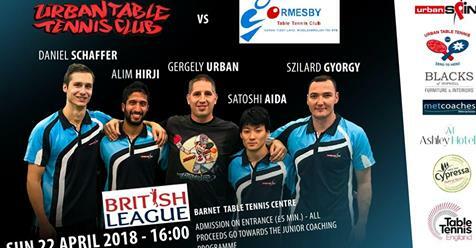 The Urban team have the same squad that won the first match of the season against Ormesby which is Satoshi Aida, Szilard Gyorgy, Daniel Schaffer and Alim Hirji. The match is being played at Barnet Table Tennis Centre, Barnet Lane, EN5 2DN with a 4.00 pm start. On the Saturday Ormesby have a fixture against the Northern Ireland team Ormeau in Belfast. The Ormesby team is the same line up as playing against Urban whilst the Ormeau team is likely to contain Irish Internationals Paul McCreery, Ashleigh Robinson, Gavin McGuire and Owen Cathcart. 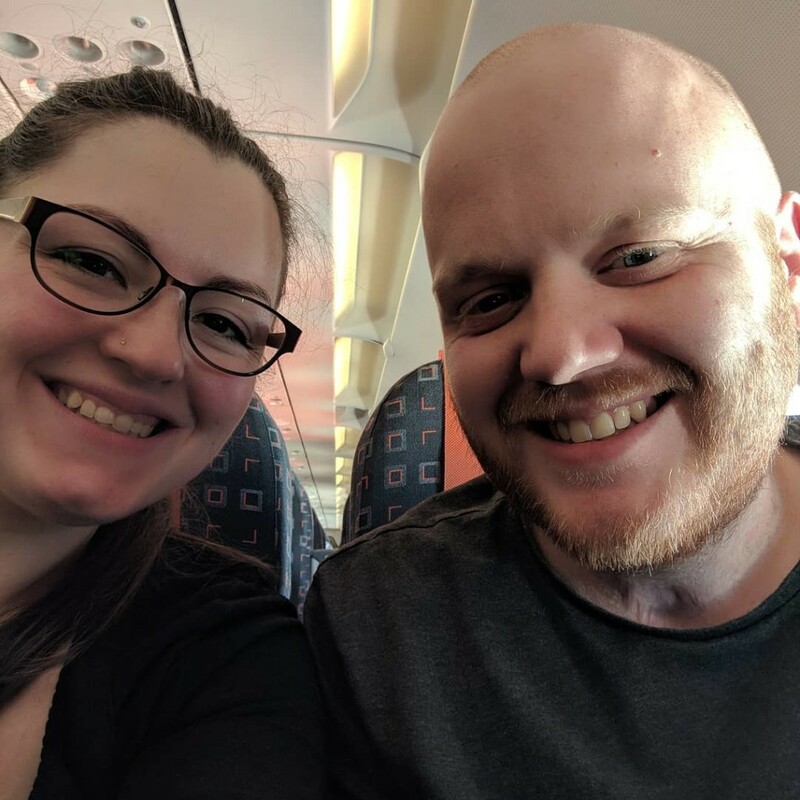 Two Ormesby teams produced first class results in the British League last weekend to avoid relegation from their divisions. 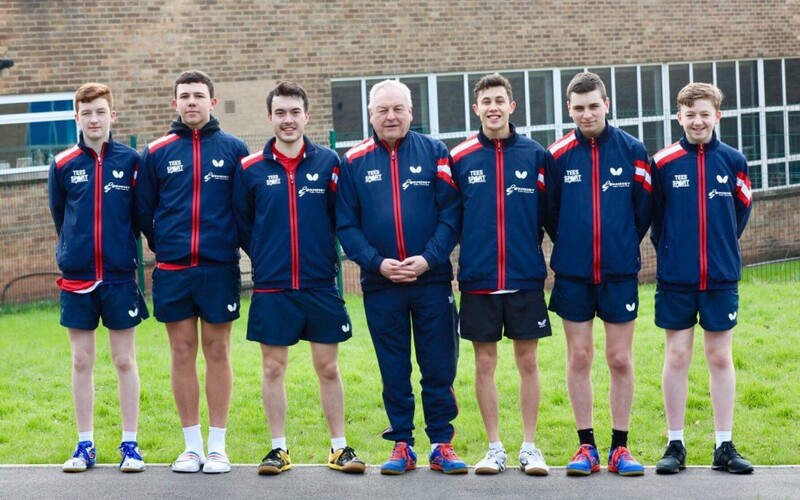 Left to right – Ormesby ll – Joe Cope, David Gofton, Liam McTiernan, Coach, Denis Neale, Adam Harrison, Tom Rayner and Josh Weatherby. 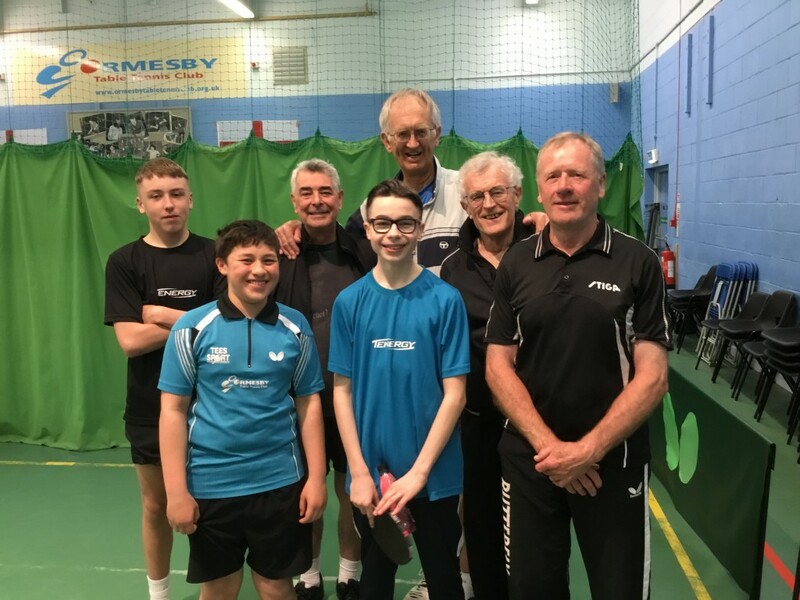 In the Championship Division which is the second division after the Premier, Ormesby’s second team avoided relegation and did very well to win 3 of their matches on a played a 4-4 draw in their fourth match. They beat Draycott 6-2, Whitworth Academy 7-1, Wymondham 6-2 and drew 4 all win the leading team Portsmouth. Joe Cope playing number three was the star of the team winning all of his 8 matches Liam McTiernan and Adam Harrison both won 6 out of 8, whilst Josh Weatherby won 2 from 4 and David Gofton won 1 from 2. Ormesby third team playing in division two also came from a possible relegation position to climb up the table with victories against the 2 leading teams Wood Green from Birmingham and Beaumont Accountancy, the local team from Middlesbrough lost 6 -3. Ormesby’s third team also beat another local team Swerve’s second team by 5-4 but in the last match lost to Draycott, Nottingham by 6-3. Swerve first team in Division one A beat Plymouth, Halton and Barrow all 6-3 but lost to Cardiff’s second team also by 6-3. This leaves Swerve in third position in the table. Joshua Harland won 6 of his 8 matches Nuradin Muktar won 5, Kieran Wardell 3 and Will Dobinson 4 from 8. Division B1 Swerve’s second team lost all of their four matches to Draycott 7-2 Wood Green 6-3 and to Halton third team and Ormesby third team by 5-4. Stephen Brunskill won 5 from 8 whilst Martin Rutter 3 and Yonatan Caspi 2. Beaumont Accountancy in the same division won two matches 6-3 against Halton and Drumchapel Glasgow 6-3 but lost to Ormesby 6-3 and to Derwent 5-4. Stephen Horsfield won 7 from 8, Anthony Phoenix won 2 from 4, Isabel Ashley won 4 from 8 whilst Sam Hitchen won 2 from 6 and Mark Walpole won 2 from 6. In division three C Ormesby’s fourth team won three of their matches 8-1 against Bishop Auckland, 5-4 against Derwent’s second team and 5-4 against Huddersfield but lost to Pudsey 5-4. Ryan Nassau produced the best results with 7 wins from 8 and Michael Young won 5 from 8. Dave Ashwell from 6 and won 4, Carl Whyte played 4 and won 2 whilst Gary Whyman played 6 and won 3. In the same division Ormesby’s fifth team Bishop Auckland and Huddersfield 6-3 but lost 5-4 to Pudsey and 7-2 to St Marys Hull. Chrissy Edwards produced the best results with 6 wins from 8 whilst Ben Savage and Luke Robinson and David Noutch all won 4. 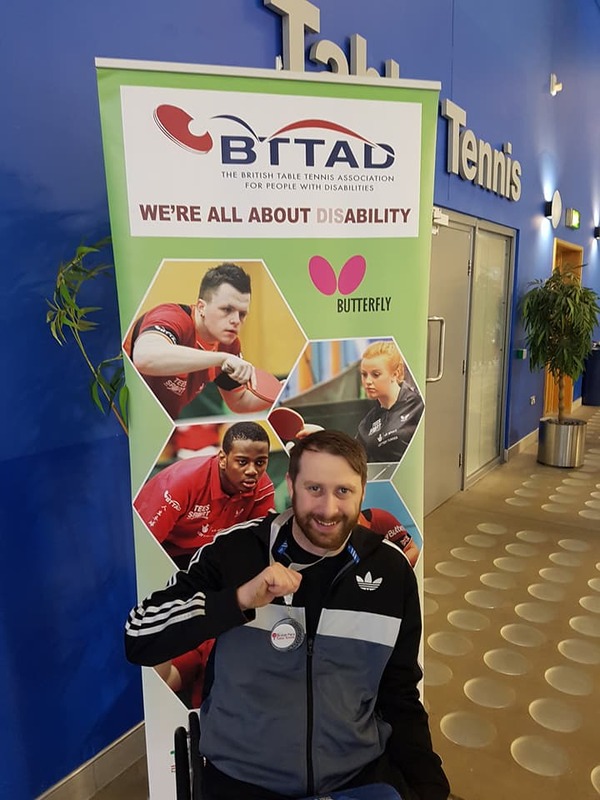 With a 6-2 victory over the current Champions Drumchapel in Glasgow, Ormesby stayed on track with their challenge for the title of the Premier Division of the British Table Tennis League last weekend. The Ormesby victory was as convincing as the score line suggests with the Teesside club racing into a 5-0 lead. Viktor Brodd who was the ‘Man of the Match’ opened the scoring with straight games win against David McBeath, a member of the England team heading for the Gold Coast for the Commonwealth Games. The score told the story 11-5, 11-5 and 11-7. Tian Ming Zhao, Ormesby’s Portuguese International player scored an important win over the Drumchapel’s Belgium International Yannick Vostes winning each of the games 11-9. Danny Reed and Darius Knight followed for Ormesby with wins against the Scottish Internationals Craig Howieson and Yaser Razouk. Brodd clinched the victory in straight games win over Howieson. Drumchapel came back into the match as McBeath won against Zhao 11-7 in the fifth, whilst Vostes proved too strong for Knight 3-0. Brodd and Reed winning two each for Ormesby were the stars of the match. This victory puts Ormesby within 1 point of the current leaders Urban of London who beat Cardiff by 6-2 on Saturday. 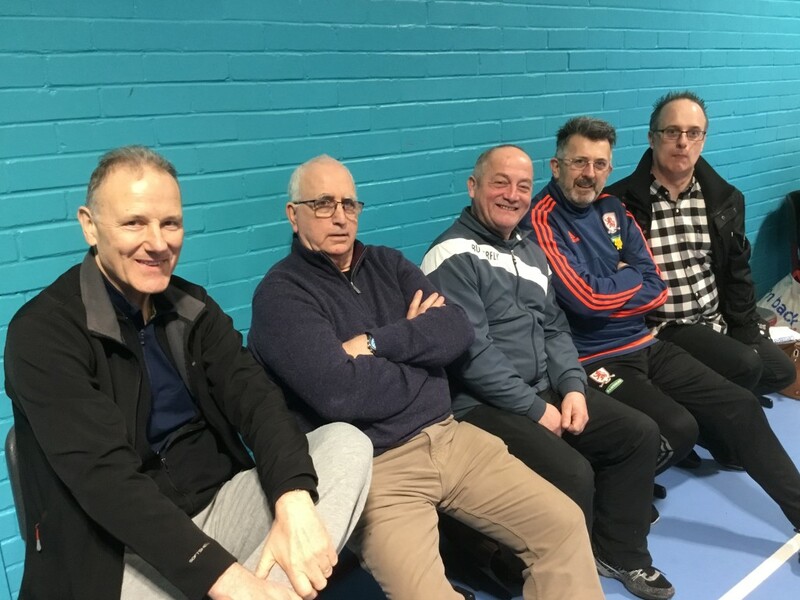 For the second year running some members of the Ormesby 50+ group of players went to Drumchapel to support the Ormesby team (as they do at Ormesby home matches). Left to right Mike Howling, Terry Bache, Malcolm Muldoon, John McCullow and Gary Whyman. This year the number of supporters doubled with 16 making the snowy trip. Ormesby have three remaining matches at home to Drumchapel, and away to Urban in London and Ormeau in Northern Ireland. If the Teesside club can continue with their current run, after winning all six of their last matches, the Championship will be theirs. Ormesby face one of their toughest fixtures in their bid to regain the Premier Division British League Championship title when they visit the current holders, Drumchapel on Saturday in Glasgow, starting at 2pm. 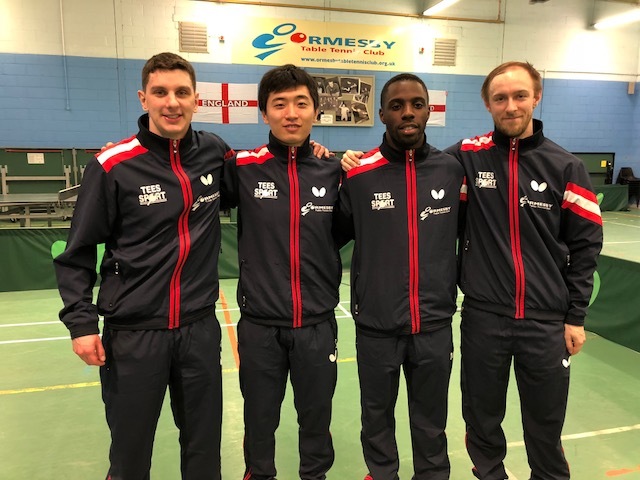 Ormesby will have the team available that defeated the leading Irish team Ormeau in the last fixture which are Tian Ming Zhao, Portuguese International from Sweden Viktor Brodd, plus the two English Internationals Darius Knight and Danny Reed. With four International ranked players in their team Ormesby have every chance of achieving a good result. 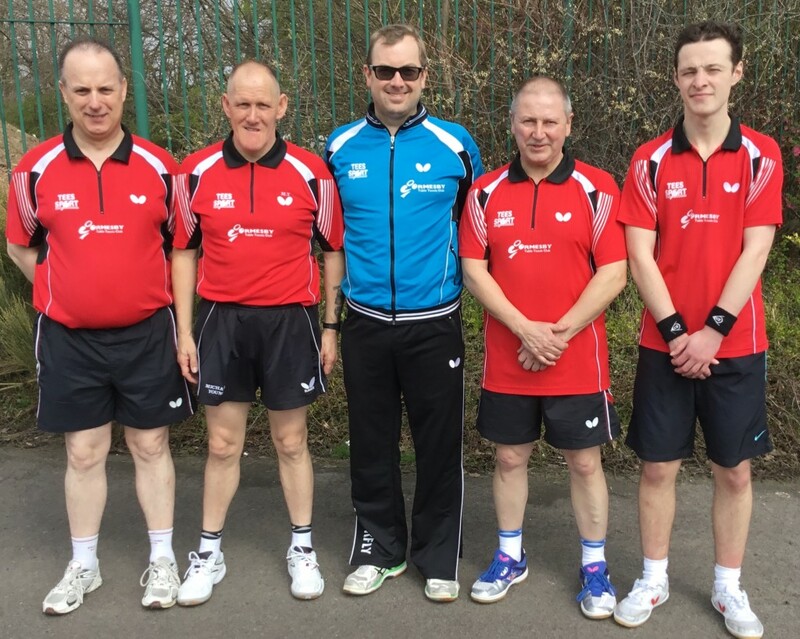 Drumchapel are led by David McBeath who reached the semi-finals in the PG Mutual English National Championships at the Copper Box two weeks ago. McBeath has been selected for the English Men’s team for the Commonwealth Games in the Gold Coast next month. Yannick Vostes, the Belgium International is at No. 2 and at Nos. 3 and 4 are two Scottish Internationals Craig Howieson who has also been selected for his national team for the Gold Coast Games and the Junior Champion Yasir Razouk. In the league table, Ormesby are currently in 2nd position and 1 point behind the Urban club from London and are on equal points with Drumchapel but with a better games average. The winners of Saturdays match are likely to be in connection with Urban for the title which may well go to the wire in the final match of the season at the end of May. 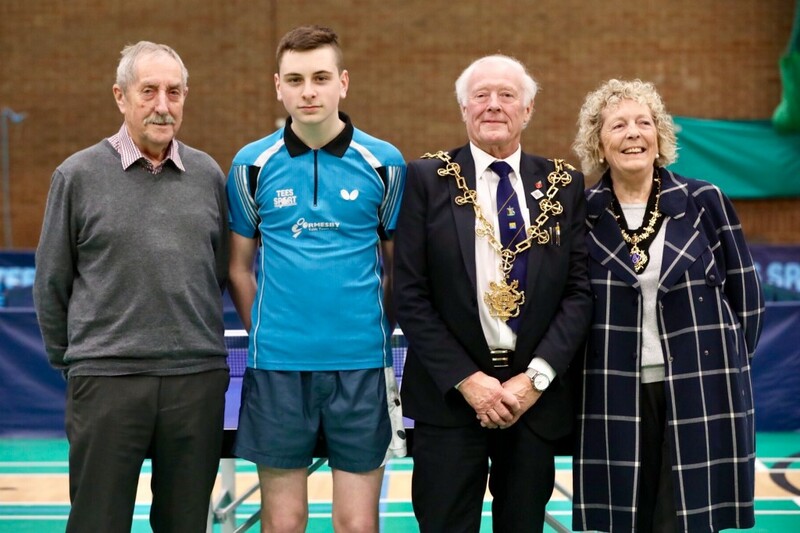 Left to right: Colin Davison, Chairman of Cleveland County Table Tennis Association, Tom Rayner, Councillor Maurice Perry Mayor of Stockton and Mrs Laraine Perry Mayoress of Stockton.